« Splat! Or maybe Splosh.. Although I can appreciate the foundation of gaming, my thoughts tend to wander off into those days of Street Fighter and Final Fantasy, but lets keep this about the name brand. My brother would let us play his Atari console and I recall how much I struggled with Pit Fall and Q-Bert. Space Invaders and Pac-Man would captivate us for what seemed like just moments and in reality hours would disappear. What a blast this was to work on and looking forward to rendering the textures of the plastic and packing some vibrant colors in there. 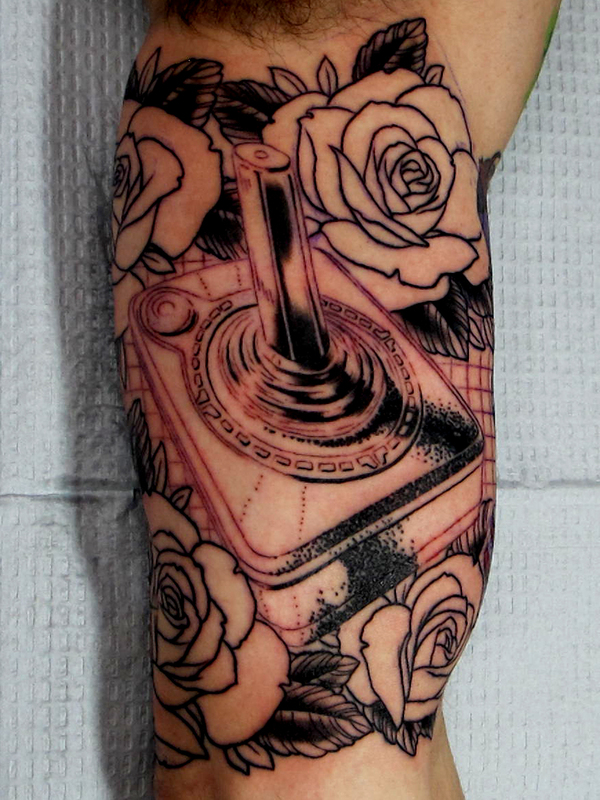 This entry was posted on April 30, 2012 at 9:48 pm and is filed under Tattoo with tags Atari, Joystick, Roses, Video Games. You can follow any responses to this entry through the RSS 2.0 feed. You can leave a response, or trackback from your own site.